Torrent or BitTorrent is the largest peer-to-peer (P2P) file-sharing communication protocol. It is used to share, send and receive files over the internet. In order to share or transfer files using the BitTorrent protocol, its users need to have a torrent client installed on their computers. A torrent client is a download manager that understands the BitTorrent protocol and other concepts related to it. Although many traditional file download managers have integrated the ability to download torrent files, the standalone torrent clients are preferred for downloading and managing torrents. Here are some of the best free torrent clients for Windows. Tixati is a cross-platform Torrent download client. It does not contain any Adware, Spyware or any other kind of Nonsense. Along with all the essential torrent downloading features, Tixati includes some other advanced features as well. It has the Web Interface option, which lets the user manage the downloads remotely through a web browser. Other features include DHT, RSS, IP Filter, Scheduler, and more. Tixati is updated frequently, which is always a good thing. A lot of customization options are available for its users. You can customize Fonts, Color Schemes, Widget Style, and Behavior. Tixati provides great download speeds, but if you think that you aren’t getting adequate speed from you connection using Tixati then you can use the in-depth Optimize guide available at the official Tixati website. Tixati has some beautiful colour schemes options in-built. It lets you select from four predefined color scheme options – Dark Background, Light Background, OS Default Colors and Custom .colors File. There are extensive options for the appearance of Toolbars, Buttons and Menus in the program. You can setup custom action like what Double-clicking on torrent file does – Strat/Stop, open Properties, open torrent File/Folder, etc. Tixati also lets you configure the main window close button and the main window minimize button for various actions such as minimize to taskbar, hide in system tray, exit program, etc. 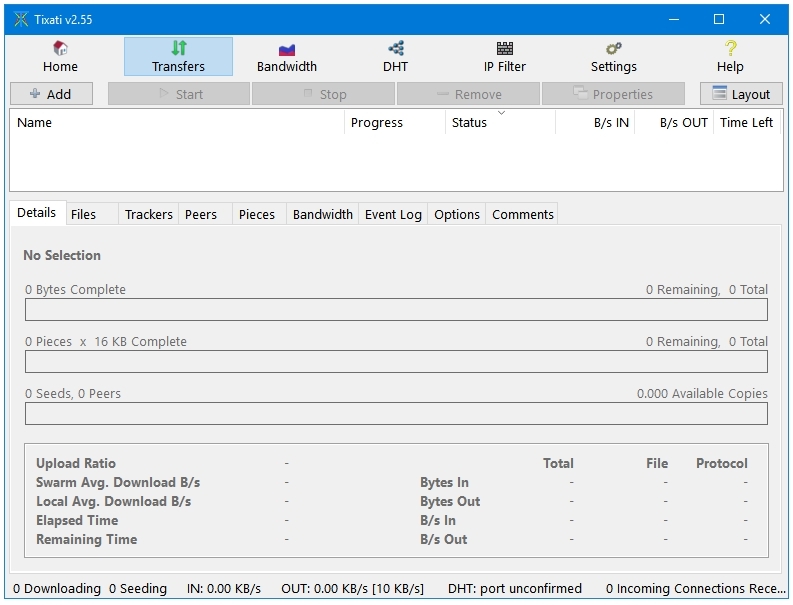 qBittorrent is a cross-platform Torrent client for available on a number of operating systems – Windows, Mac, Linux, OS/2, and FreeBSD. It’s a free and open-source software released under the GNU GPL license. qBittorrent has a plethora of features, and is available in a number of languages. 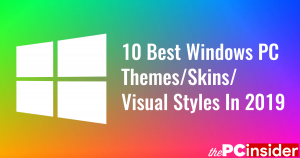 The Options window displays all of the settings and features in eight side tabs, which are – Behavior, Downloads, Connection, Speed, BitTorrent, RSS, Web UI, and Advanced. Behavior contains links to general program working options. Downloads lets you manage various downloading and saving management settings. BitTorrent tab has options such as Privacy, Encryption Queueing, and Share Ratio. Connection, Speed and RSS lets you set respective settings. The Web UI tab has settings for the remote control of downloads in qBittorrent. The final tab, Advanced, has advanced BitTorrent protocol options. Some of its features are Integrated torrent search engine, Remote management of torrents through Web interface, RSS feed support, Torrent creation tool, IP Filtering, Bandwidth scheduler, DHT, Private torrents, Encrypted connections, and more. 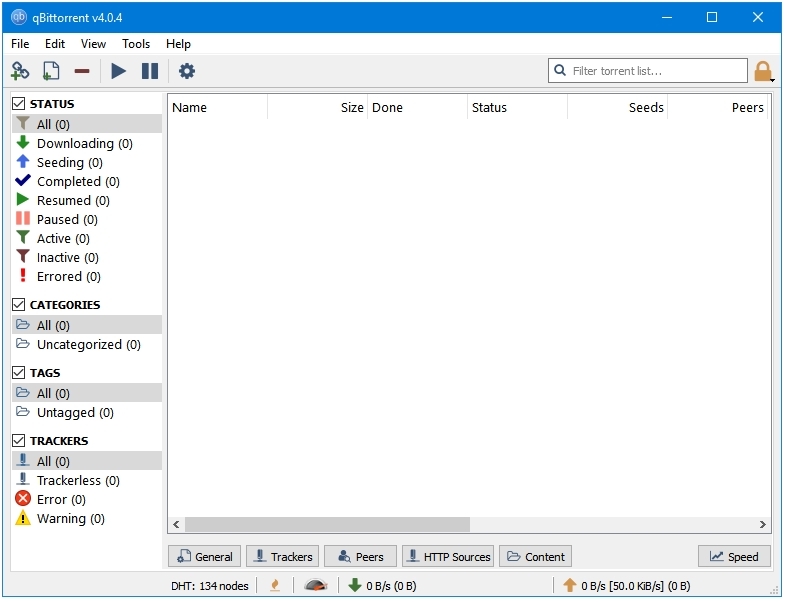 qBittorrent has been available for more than a decade, and has proved itself to be a reliable Torrent client. Deluge is a fully-featured cross-platform torrent client available for all three main Desktop operating systems – Windows, Mac and Linux. It’s an open source application released under the GNU GPL license. Deluge is fully capable of performing all of the torrent downloading and managing tasks required by most users. What makes this program interesting is its ability to add modules in the form of Plugins. Deluge is a modular program, many of its features are available in the form plugins – Inbuilt and 3rd party. The inbuilt or (Included ) plugins are developed by the main program developers whereas the 3rd Party plugins are developed by other programmers from the community. The inbuilt plugins can be enabled by going to the Preferences section of the program. The included plugins are – AutoAdd, Blocklist, Execute, Extractor, Label, Notification, Scheduler and WebUI. You can add the 3rd Party plugins by clicking on the Find More Plugins button in the Plugins section of the Preferences window. Deluge has a Web Interface feature called Daemon that lets its users control their downloads remotely. The default color scheme has shades of blue that matches well with the default Windows theme. The same cannot be said about the font of the program. Transmission is an open-source software released under the GNU GPL license. According to Wikipedia, Transmission enjoys the biggest market-share among the open-source BitTorrent Clients. It is the default BitTorrent client in most of the Linux Distributions, which is one reason for its big market share. You get only the essential and most commonly used features here in this client. 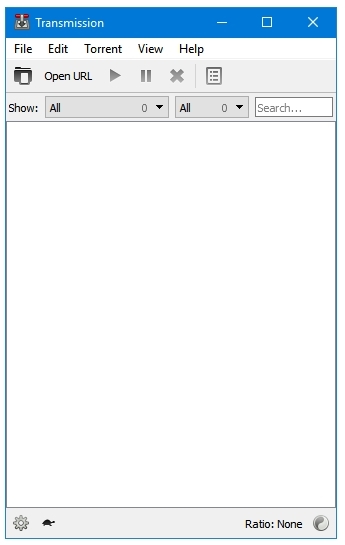 This is what a default Windows torrent client would have looked like, if there were any. The minimal interface looks good on each one of the big three operating systems – Windows, Mac, and Linux. The Settings button (gear icon) at the bottom-right lets you adjust three settings – Download Speed, Upload Speed, and Stop Seeding at Ratio. You get a Tortoise Mode that you can enable by clicking on its icon, which is placed right next to the Settings icon. It enables or disables Temporary Speed Limits, which is set 50 Kb/s for Download as well as Upload by default. The Preferences has some other settings and features such as Speed Limits, Encryption Mode, Blocklist, Download Queue, and Remote control, which is Transmission’s web client component. Transmission is exactly was its tagline says – A fast and easy BitTorrent client. No BitTorrent Client list is complete without uTorrent (stylized µTorrent), the most popular BitTorrent Client on Windows. It has become much more than just a (very) tiny BitTorrent client. uTorrent comes in four versions – Basic, Ad-Free, Pro, and Pro+VPN. Only the Basic edition is free (and full of ads). uTorrent is a recommended option only if you do not mind spending some time for disabling ads, promos, adware, and other annoyances that come with its free version. It tries to install two third-party tools and also tries to change web browser homepage and new tab pages. During its installation, there comes an Optional Offer window that, if Accepted, will change your web browser homepage and new tab page to Yahoo, and install Adaware Web Companion. Click Decline if you don’t want to make these changes. The next window provides another Optional Offer; it offers to install Avast Free Antivirus. Click on the Skip text to skip this offer if you already have an antivirus installed on your system. Rest of the installation process is safe.